You will discover its historical monuments and its landmarks, its financial and fashion districts, its renowned football clubs and its taste for food and wine, all in your everyday life. The city has long been the center where you can find the finest Italy has to offer in food & beverage and related industries. It is the hub of fashion, creativity, design, and culture. Thus, Milan is the ideal campus to discover Italian excellence, allowing SDA Bocconi to bring together business and innovation with the unparalleled wealth of the Italian cultural heritage. 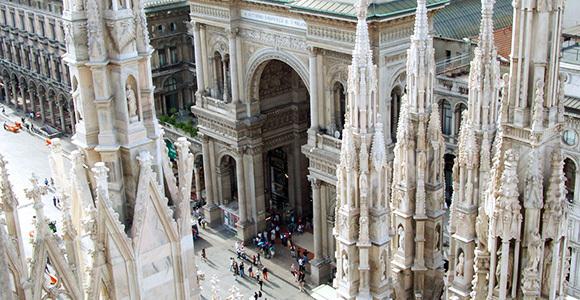 Around 200 Italian banking groups and more than 40 foreign banks are headquartered in Milan. ABI, the Italian banking association that represents the country's banking system and the Stock Exchange (with over 225 Italian companies listed), also has its headquarters in the city. From shoes to clothes, from Moka to Ferrari, Italian style is renowned all over the world. Milan is a hub for fashion and design, boasting the highest concentration of fashion houses, showrooms, outlets, and international events. Milan is not just a business center, it also leads the way in the non-profit sector with 6,000 organizations operating here to promote social justice and sustainable development in order to improve everyone's quality of life. These are values that SDA Bocconi also shares and works to promote. The city plays host to major art collections and can boast many historic buildings that testify its long history and are worth visiting. In addition to this, Milan is also geographically well positioned: within two hours you can easily reach several seaside and mountain resorts, as well as the lakes. Milan has one of the biggest centers for conferences and exhibitions, with over 1.6 million square meters of floor space. Every year, around 4.5 million visitors attend the 80 largest events that take place there. In addition, 2015 was the year of Expo Milan: the area that hosted the pavillions is now being repurposed for a university campus and an avant-garde scientific-technological center. In Milan there are over 700 media enterprises, which include book publishers, national newspapers, TV production studios and radio stations for RAI and Mediaset, as well as most of the digital media industry. Other key sectors driving the city's economy include state-of-the-art healthcare facilities and research centers for medicine, biotechnology, chemistry, and engineering. You will find the most useful and personalized help from the Student and Internal Relations Services of the Masters Division. This service helps participants with their application for visas and permits to stay, and to get settled in Milan. It also prepares a detailed Student Resources Guide, which is given to all students. The guide is full of useful addresses, up-to-date services and references, and tells you where to find special deals. MBA students typically rent an apartment near campus in Milan, either by themselves or with MBA classmates. SDA Bocconi has an arrangement with an external housing consultant who assists incoming students with housing placement. Students who accept their place in an MBA program will receive details on working with the housing consultant. For students who need a place to stay in Milan for an initial few days after arrival, a hotel is an ideal option. Many hotels offer special rates for SDA Bocconi students. For information and bookings call 199 199 650 (from Italy) or +39 0871 803 614 (from abroad). Of course, MBA students will spend a lot of their time studying. The majority of students prefer to study at the school, which takes care of all their needs. MBA facilities consist of 12 classrooms equipped with multimedia stations and more than 80 areas for group work. A reading room for individual study is also available. The Masters Division is equipped with a dedicated wireless system. Discounts at EGEA (Università Bocconi bookshop), on working papers and material produced by the teaching staff and by the university and SDA research centers. Bibliographical searches on request. Access to the Language Center in Piazza Sraffa 11 for self-learning or language courses. An MBA is not all about studying, and many students will want to take some time to enjoy sports. The European MBA Tournament ("Masteriadi") held every year at HEC in Paris is an ideal occasion to show team spirit and excellence. Sailing fans can join the MBA's Cup - Mediterranean Regatta and Conference, the sailing week-end, the Barcelona or the Cranfield regatta. The school also organizes an MBA Ski Cup, and being just a couple of hours from Europe's most beautiful mountains makes it easy to organize skiing weekends in small groups. Sport enthusiasts can take part in soccer tournaments, or jog in the parks near the school. Further opportunities include the "Naviglio Pavese" nearby, for canoeists, and many gyms—including the "Palestra Bocconi"—as well as clubs, swimming pools, and sports centers. To know more visit Milanosport. The area around SDA Bocconi is well-served by public transport. Weekly or monthly tickets for students are available at news stands and tobacconists. Many students opt for a bicycle or a scooter to travel around Milan. Both of these can be parked within the School. There are several bike sharing services in the city (BikeMi is owned by the municipality of Milan, with a docking station in front of the SDA Bocconi campus), as well as car sharing services. From 10pm to 2am you can book a public "on-call bus" (to know more: Radiobus). For taxi service in Milan you can call +39 02 4040, +39 02 6767, +39 02 8585. They can also be booked four or five hours beforehand. In addition, it is easy to reach SDA Bocconi from outside Milan. Bocconi University has a full-service cafeteria at Via Bocconi 12. Of course, you can try one of the numerous cafés, restaurants, pizzerias and bars located close to the university, which cater to a myriad of tastes. In Milan, dining out and the art of conversation over food are extremely popular social activities.